stylos: The PA (John 7:53--8:11): A "Floating Tradition"? It has sometimes been suggested that the Pericope Adulterae (PA; John 7:53—8:11) is merely a “floating tradition” that was never a stable part of the Gospel of John. This charge is part of the rhetoric aimed at undermining the antiquity, credibility, and authority of the passage. According to Maurice Robinson the PA appears in 1,476 mss of John. So, there are, in fact, only seven examples (counting family 13 as a single example) where the PA is moved, and all of these examples are in late minuscule mss. 3. The only location attested for the PA is John 7:53—8:11 until the ninth century. It was not a “floating tradition” in early Christianity. 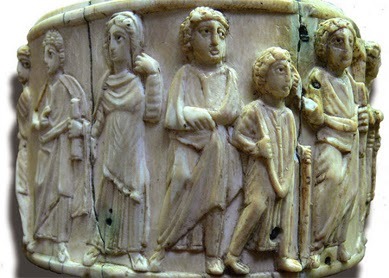 At the same conference Jennifer Knust of Boston University discussed non-textual evidence for the antiquity of the PA including an Egyptian ivory pyxis (small, lidded jar) from the fifth-sixth centuries which depicts the Samaritan Woman at the Well along with the Woman Caught in Adultery. This shows the PA was known early (by at least the sixth century AD), was known in Egypt (i.e., not just in the Western church), and was associated with the Gospel of John (i.e., depiction with the Samaritan woman from John 4 is on the same object with the woman caught in adultery from John 7:53—8:11). Image: Ivory pyxis with Samaritan woman at well (left), Jesus with scroll in hand (center), and woman caught in adultery (right); 5-6th century, Egyptian; Current location: National Museum, Paris. Image: Side view of the pyxis, focusing on the the woman caught in adultery. For a discussion of this object and others (like a similar pyxis now in St. Petersburg, Russia), along with various supporting arguments of the antiquity of the PA, see Jennifer Knust and Tommy Wasserman, “Earth Accuses Earth: Tracing What Jesus Wrote on the Ground,” Harvard Theological Review 103:4 (2010): pp. 407-446. The time has come to put to rest the perpetuation of the idea that the PA did not have a fixed place in or association with the Gospel of John in early Christianity.